Our 7.5m/25ft Auto-Lock Measure Tape has been designed to meet rigorous requirements. From the construction industry to individual use, this measuring tool uses the strongest materials throughout. The large rubberised case has a ridged design for anti-slip grip and a tailored design which sits flat against hard surfaces. When not in use, it provides the perfect protective home for a 7.5m neon yellow measuring tape. The highly visible design has been chosen for convenience. When paired with bold black numerical markings, it offers the perfect way to take accurate measurements on large-scale projects. For heightened viewing, every 10cm mark features in red - another clear and visual way of quickly noting down distance. The angled metal end cap gives you a flat surface to place against end markers and a stopped plug when retracted back in. In addition, we use a firm but flexible metal to construct the tape measure to reduce the chance of breaking and improve lifespan. For projects where you need the freedom to move, the auto-lock feature on this tape measure comes in handy. Operated by a large red button on the case, it locks and unlocks at your ideal distance. This significantly reduces the risk of injury to all users while giving you the option to measure up to 25ft in inches and 7.5m in centimetres. Our bulk purchase options are an effective way to stick within your budget. 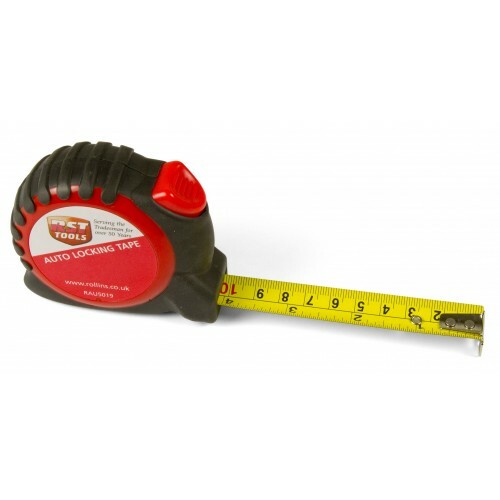 For orders of 10 or more tape measures, we can offer an individual product price of just £8.28. For larger orders over 100 rulers, we can offer an individual product price of £7.50.